Ocean view from Sandals Royal Hicacos balcony. View from an upper level accomodation at Sandals Royal Hicacos in Varadero Cuba. Swim up pool bar in main pool at Sandals Royal Hicacos in Varadero Cuba. A view from the apartment balcony into the gardens at Sandals Royal Hicacos in Varadero Cuba. A wall mural portraying Fidel Castro in the lobby at the Sandals Royal Hicacos in Varadero Cubs. View from inside the lobby at Sandals Hicacos in Varadero Cuba. Paintings include Fidel Castro. View of main pool at Sandals Royal Hicacos Resort and Spa in Varadero Cuba. Street view leading to entrance or Sandals Royal Hicacos Resort and Spa in Varadero Cuba. 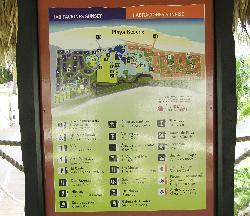 Sandals Royal Hicacos site map on sign post. This is a photo of the site map for Sandals Royal Hicacos Resort in Varadero Cuba. Photo of the Beach Activity Centre at Sandals Royal Hicacos. Taken from a pedal boat while in the ocean. Main site for the Sandals chain. Set on one of the finest locations on Varadero Beach in the province of Matanzas, Cuba, Sandals Royal Hicacos Resort & Spa brings its Ultra All-Inclusive concept to Cuba. This resort is thirty (30) minutes away from Varadero's International Airport, ninety (90) minutes away from Havana International Airport and ten (10) minutes from downtown Varadero. from site: Set on one of the finest locations on Varadero Beach in the province of Matanzas, Cuba, Sandals Royal Hicacos Resort & Spa brings its Ultra All-Inclusive concept to Cuba. Mostly non-partial reviews of the resort.